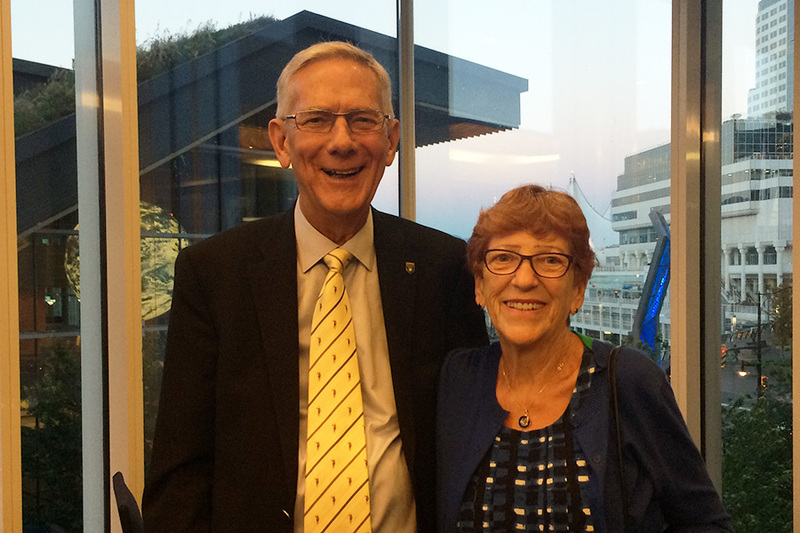 On Thursday, September 27, Frank and Phyllis Abbott met with Dean Kishor Wasan in Vancouver to sign the paperwork for the Frank and Phyllis Abbott Legacy Fund at the College of Pharmacy and Nutrition. The fund will support the college’s priority areas, as determined by the dean. “I was born, raised and educated in Saskatchewan. I have always been proud of my roots and especially of the College of Pharmacy as it was then known,” said Frank when asked about his motivation for giving to the college. Dr. Frank Abbott completed his Bachelor of Science in Pharmacy (Great Distinction) in 1959, and his Master of Science in Medicinal Chemistry in 1962 at the University of Saskatchewan. He also holds a Doctor of Philosophy in Medicinal Chemistry from Purdue University. Frank began as a faculty member at the University of British Columbia (UBC) in 1965, and served as the Dean of the Faculty Pharmaceutical Sciences from 1996 to 2002. He currently holds the titles of Professor and Dean Emeritus at UBC. Phyllis Abbott completed her nursing training at Regina Grey Nuns Hospital, and specialized in pediatrics. She worked at various locations in Saskatchewan and British Columbia, before spending twenty five years of her career at British Columbia Children’s Hospital. Phyllis chose to donate to the college as her work experience at the Royal University Hospital was valuable for her future career, and provided her the opportunity to support Frank and herself while he attended graduate school at the U of S.
Planned gifts to the College of Pharmacy and Nutrition can provide opportunities for students that would not otherwise be realized in their regular curriculum or extracurricular activities. Andy Collin, the college's development officer, can assist alumni in deciding how to give to the college, and how to direct where their money goes. Andy can be contacted at 306-966-5823 or andy.collin@usask.ca.